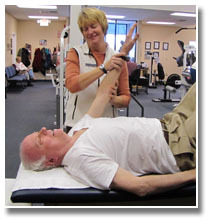 Our Upper Perk PT facility is conveniently just off of Route 663 next to the Pennsburg Medical Arts Building. It is fully accessible to all individuals and handicap parking is available. Our Springfield PT facility is located at 4 East Woodland Avenue, Springfield, PA 19064, next to Woodland Ave trolley stop and Nicks Roast Beef. Our New Hope PT facility is conveniently located on Route 202 in the Logan Square Center. It is fully accessible to all individuals and handicap parking is available.